BEAUTYDIARIES... well this is a first! I think this is possibly one of my first blog posts talking about something other than F A S H I O N! My first beauty blog post is all about, the dreaded.. ADULT ACNE!! 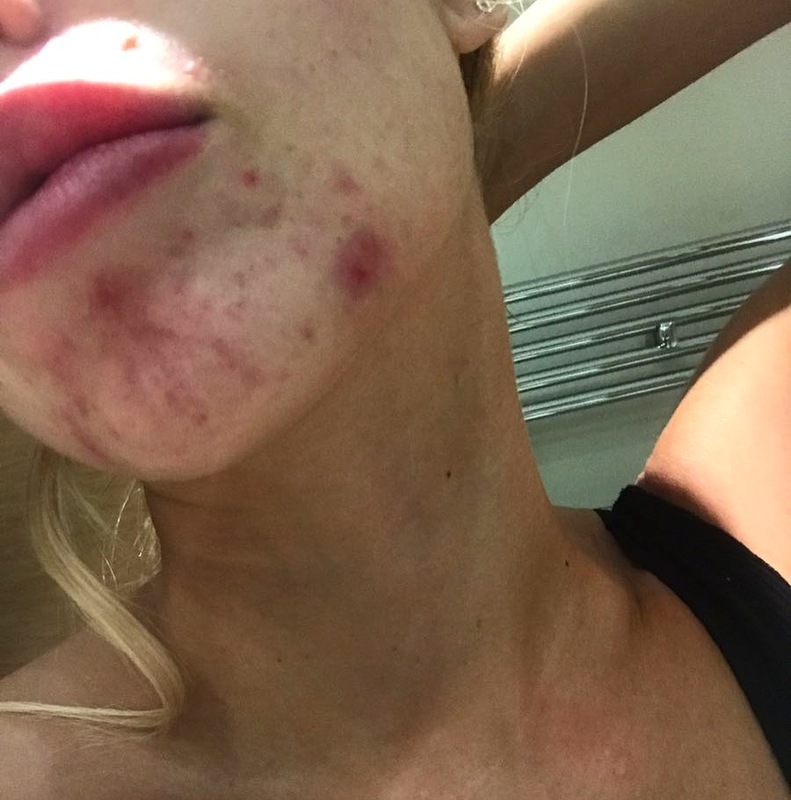 Having modelled for 12 years my skin has been through some ups and downs with the job-travelling on planes regularly, excessive make-up being applied constantly, wearing foundation in 40 degree heat while shooting.. your skin IS of course going to flare up! Not great when you suffer from skin problems already! My hormones had a HUGE part to play in me developing ADULT ACNE! yessss.. its the worst.. I wanted to hide away, cancel all night outs because of being worried my foundation would be off by the end of the night and I was laid bare! I spent literally thousands of £££ on products, I saw every dermatologist under the sun and it all came to a head while on a shoot in Morocco with FAIRFAX & FAVOR who I have just done my AMY collaboration with. Josh Patterson (former MADE IN CHELSEA) was sat with me at breakfast where I literally wanted to hide while sat in a dressing gown waiting for the MAKE-UP ARTIST to come and collect me before the shoot. I remember him saying how he had ACNE and the only person that helped his skin was Pam at MORTAR AND MILK in Fulham. He gave me her no and I booked in an apt for the day I arrived back in London. PAM.. saved in my phone as (THE SKIN LADY) was just insane, the only person I can say actually looked at the reason behind why I was getting spots and in a certain place- mainly around my chin and forehead. She spent hours chatting with me about my whole lifestyle, literally EVERYTHING! There was no holding back…She looked at my skin through all different cameras she had in her clinic and she advised weekly visits and to start with a product called EXUVIANCE. I can honestly say (NOT PAID TO SAY THIS) that it transformed my skin within a month, the only product that if I run out of it I panic!! My skin needs it! I was desperate to go on Roaccutane at one point because it got that bad, especially having a job as a model it made the whole thing even worse going on shoots and being left bare faced for hours on end, sometimes with other models too! I just felt awful.. SPOTS.. what ever anyone says can make you feel UGLY whoever you are!!!!! THE PIC BELOW WAS THE BREAKING POINT FOR ME, I actually sent it to my sister and just cried after and then messaged PAM and begged her to help me find a solution! Literally had her on speed dial! I spoke to Pam about going on Roaccutane and she advised going back on a contraceptive pill first to try balance my hormones, I am now on one called BREVINOR which is similar to DIANETTE without all the side effects like gaining weight, leg cramps etc that come with it. Within 3 months my skin was crystal clear and still pretty much is to this day, a year and a half on! It saved me going on Roaccutane and experiencing all those horrible side effects you get from it. My boyfriend will laugh at this but when I met him I used to sleep in my MAKE-UP and take it all off the minute he went to work because I hated him seeing me like that… I am sure lots of you babes can relate to that! ACNE affects relationships haha! P.S the product that saved me from baring all was LAURA MERCIER SECRET CAMOUFLAGE. It is so pigmented, it covers spots and scaring like nothing else, hardly anyone knew I had skin problems because of this amazing product, which I still swear by to this day. I also now visit DR ZAMANI on Sloane Street in Knightsbridge on a monthly basis for different regular skin facials and peels to keep my skin on track, she is another SKIN BABE, she just gets it and she deals with lots of celeb clients… would LOVE to tell you all who…..! Please feel free to dm me on INSTA @amynevfashiondiaries if you have any other questions you want to ask me I am more than happy to help or share any advice. Looking forward to posting my next BEAUTYDIARIES post for you all in a few weeks time on my EVERYDAY MAKE UP LOOK and what products I am using, I will try film it for my youtube also so you can watch it as well. CHAT SOON & I hope this post helped you babes..nothing is as perfect as it seems!! Remember that..